The conventions we go to feature so many things that readers enjoy and chances are if you enjoy them you're probably pretty knowledgeable about those things. The recent NJ Horror Con and Film Festival had everything a horror film buff would love, including the "Movie Buff" card game. According to a recent article in AdWeek, board game sales are seeing a big spike as they make a comeback in popularity. It is welcome news in an age where more people engage through their devices over social interactions. 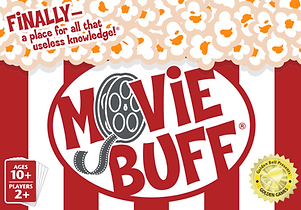 The convention had a lot of fans and celebrities interact but a game like "Movie Buff" will definitely keep it going with like minded individuals. “More people are binge watching and cooking at home, and they’re also playing board games at home, rather than going for an expensive night out. Instead of Snapchat or texting, it gives people an opportunity to come together face to face and have fun.” -Juli Lennett, toy industry analyst at NPD Group.